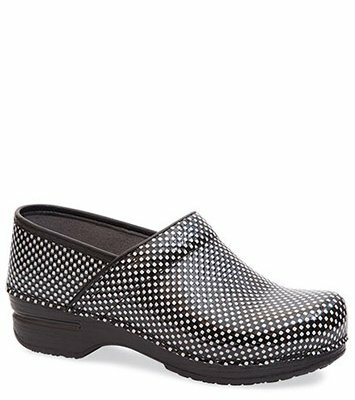 The Dansko Black White Check Patent from the Pro XP (Men) collection. The XP Clog carries the Seal of Acceptance from the APMA (American Podiatric Medical Association). The APMA Seal of Acceptance is awarded to shoes that promote good foot health and is independent proof that Dansko shoes are made with your comfort and long-term wellbeing in mind. Dansko's XP Clog outsole has been tested for Slip Resistance by Precision Labs using the Mark II machine.